Air Actuated Ball Valves – Plast-O-Matic Valves, Inc. Double acting Air x Air or Fail-safe Air x Spring actuators designed for corrosive service. Options include Limit Stops, Limit Switches, and Electro-Pneumatic Positioners. 3/8″ – 4″ valve sizes, 2-way and 3-way. Double acting Air x Air or Fail-safe Air x Spring actuators designed for corrosive service. 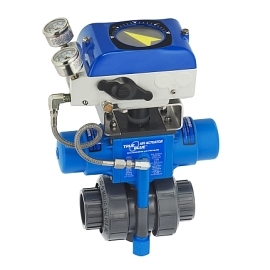 Features rugged plastic construction to NEMA 4X standards with direct manual override. 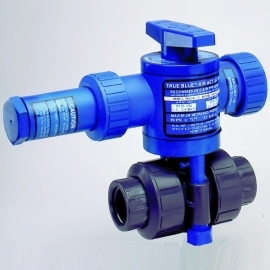 Fail-safe valves can be normally-open or normally-closed. Most units can be hydraulically actuated. For valves 3/8″ – 4″ sizes in PVC, CPVC, Natural Polypro, PVDF with FKM or EPDM. Available with NPT, socket, BSP, Sanitary, and other connection types. Double acting Air x Air or Fail-safe Air x Spring actuators designed for corrosive service. 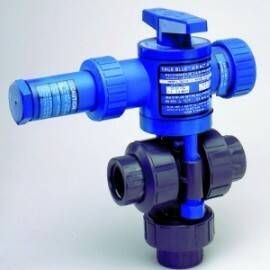 Features rugged plastic construction to NEMA 4X standards with direct manual override. Most units can be hydraulically actuated. For valves 1/2″ – 2″ sizes in PVC or CPVC; 3″ & 4″ sizes in PVC, CPVC, Natural Polypro, PVDF. Available with NPT, socket, BSP, Flanges, and other connection types. Uses force balance principle of operation and 4-20mA electronic signal for precise control of air actuated ball valves. Combine with Series ZC characterized or custom-profile ball valves for exact flow rate control.